The penguins of Gourdin Island were a tough act to follow, but the second landing of the day held a different sort of interest. 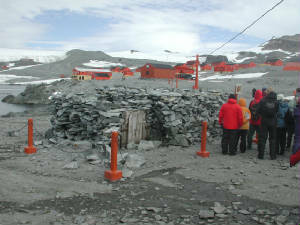 We were to dock at the only human settlement to be visited on this trip, the Argentinean “colony” at Esperanza Base on the Antarctic Peninsula. While the Antarctic Treaty of 1959 bars member nations from establishing territorial claims on the continent, it does not apply to claims already established, and the Argentineans had maintained their base near the tip of the peninsula since 1952. The first birth in Antarctica occurred here in 1978 when a baby named Arturo Palma was born to the wife of a naval officer. Today 55 people, including 21 children, live at Esperanza year round. 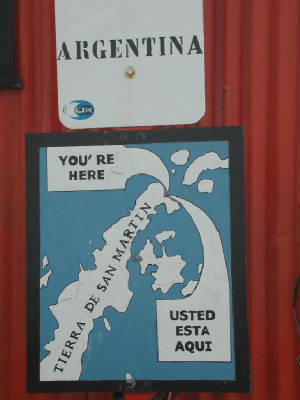 A glance at the globe indicates the affinity that Argentina (and Chile) must feel to the Antarctic Peninsula, a mountain ridge reaching north from the mass of Antarctica like a crooked finger pointing to the tip of South America. Geologists say it continues in a submarine ridge right up to the base of the Andes. From a geopolitical standpoint Argentina found it only natural to extend its territory to these southernmost Andes, and to these South American settlers, life at an Antarctic station might not be much different from a posting in the high altiplano – colder, but also more oxygen. But even the highest altiplano has plant life and llamas. Here there was only rock- a sharp broken shale covering the ground – and penguins. Even with a church, a museum, and a “casino” (community center), Esperanza had the barren look of a hardship outpost. Buildings were of the prefab, military type, nothing picturesque about them. A lowering cloud cover kept the air temperature above freezing on this December day, but the fierce wind blistered our hands and cheeks, making us grateful for the warm hospitality of the casino, where a friendly Argentinean girl served us free coffee and bottled water. This is one of the windiest places on earth, and we thought with awe of the fortitude of those three members of the Swedish Nordenskjold expedition who had been stranded here in 1903 when their ship, the Antarctic, put them ashore on a supposed short-term assignment, then sailed away and sank. The crude stone hut built by the Swedish castaways stood near an Adelie penguin rookery at the edge of town. They must have been grateful for those penguins that provided warm feathered skins to cover the floor of the hut as well as most of the men’s diet for the next ten months. The resourceful explorers piled flat rocks to the height of the tallest man on the team (less than six feet), covered the roof with their sledge, and put up a tent inside to keep off the wind. They survived the long dark months of winter, but when they finally ventured out in the spring and successfully trekked 200 kilometers to Snow Hill Island to contact other members of the expedition, they were so unrecognizable in their rags and crust of soot that former shipmates thought they had encountered the indigenous inhabitants of Antarctica! We were to cross paths again with this benighted expedition later on in our Antarctic journey. After saying an appreciative good by to our Argentine hosts, we returned to the Explorer for the recap and briefing of the day. We wondered what lay before us because we were traveling expedition style without a prearramged daily itinerary. We had been told that this year had seen an unusual weather pattern with ice closing off the western coast of the Antarctic peninsula, the coastline most favored by cruise ships. Rather than skirting delicately along these shores, where landings would be impossible, the leadership of the Explorer had decided to head eastward into the Weddell Sea, following the path of Nordenskjold and of Shackleton. The fact that both of these early expeditions had ended with their ships crushed in ice only added to our sense of adventure.